Basic information on the lay of the land, its history and local peculiarities - so you can act like a local during your stay in Zurich. Tobacco: 200 (40 to some countries) cigarettes or 100 (20) cigarillos or 50 (10) cigars or 250 g (50) of smoking tobacco. Alcohol: 1 litre of spirits over 22% vol or 2 litres of spirits with less than 22% vol, 4 litres of still wine, 16 litres of beer. Other goods: Max value of all goods: 430 euros for air travellers and 300 euros for other travellers. Goods over these limits must be declared when entering an EU-country, additional taxes and VAT may apply. In Switzerland there is duty-free shopping for arriving passengers as well. The drinking age in Switzerland is 16 for wine and beer and 18 for spirits and alcopops. The standard sizes for beer are the 0.3 litre Stange (pronounce: shtang-eh) and the 0.5 litre Grosses (gro-sus). The long-standing medium-scale brewers (in Zurich you‘ll usually find Feldschlösschen and Hürlimann, which both belong to the Danish Carlsberg breweries) are increasingly getting competition from innovative local brewers. Check out Sprint, Paul, Chopfab or Appenzeller for instance. Swiss wines are also not to be underestimated. While the best may come from further south, you‘ll find some very good Blauburgunders (red) and Riesling Sylvaners (white) from the Zurich region. Traditional Swiss spirits are fruit brandies, cherry (Kirsch) and pear (Williams) being the most common. Electricity in Switzerland is 230 V, 50 Hz AC. Plug sockets are round and take three round pins - they can take Europlugs with two pins. If you are coming from the US, the UK or Ireland you definitely need an adaptor - as well as from many other countries. Travellers from the US (and other countries with a a different voltage than 230 V) additionally need a voltage converter. In modern hotels you might find multi-use sockets. Otherwise ask for an adaptor at the reception or buy one in a traveller's or electronics shop (main station). In the era of laptops and smartphones what you really need are hotspots. Many cafés in Zurich have free Wi-fi. There is even a free outdoor Wi-fi at Limmatquai, between Central and Rudolf-Brun Brücke - simply connect your device and follow the instructions. You can also simply rent the tiny pocket device Travelers Wifi and you'll have an unlimited and speedy 4G/LTE data connection in all of Switzerland. Order it here: www.travelerswifi.com. And you will find the Wi-fi providers Monzoon and Swisscom all over the city. All you need to connect to them is a credit card. Prices are rather high. Switzerland has four official languages: German (spoken by 64%), French (20%), Italian (6.5%) and Romansh (0.5%). Zurich lies in the German speaking part of the country, where people speak a German dialect, so called Swiss German or Schwyzerdütsch, which differs from region to region. Be it among friends, at work or when dealing with the authorities, people speak dialect. For anyone who speaks or - even worse - is learning to speak German, this can be tiring because at first it‘s very hard to understand even for people with a German mother tongue. However, Swiss people use standard German, so-called Hochdeutsch, when writing and speaking at school and so do the presenters on TV. When Swiss realise you are a foreigner they will usually switch to standard German. Keep in mind that a lot of Swiss aren't practised in standard German - it‘s like a foreign language to them too. Occasionally German speakers from outside Switzerland claim they have no trouble understanding the dialect – but most of the time the Swiss they were speaking to were actually trying their best to speak standard German. A lot of Swiss speak English fairly well, especially the younger generation. So generally getting by in English is no problem. Often the first foreign language at school is still French, so if you happen to speak some you can try to use it, especially with elderly people who don‘t speak English. As Italian is the country‘s third language, people with a higher education usually speak some Italian as well. Here are a few German phrases and some typical Swiss German words - it will be always appreciated if you use a few Swiss words. The 'r‘ in Swiss German is rolled, the ‘ch’ is pronounced like in the Scottish loch. Mind your throat. Zum Wohl! (tsoom vol) Cheers! Swiss post is generally reliable and fast and usually it shouldn’t be a problem to find a clerk who speaks English. Swiss post also offers banking services: all your financial transactions can be taken care of here - even for sending cash with Western Union the post office is the right place. Just pick a ticket at the machine and wait until your number lights up and the screen tells you on which counter you will be served at. The post accepts euros. There are post offices all over the city - the Sihlpost close to main station is the one with longest opening hours. Despite the boom of mobile phones there are still lots of public phones in Zurich. They all take coins, most of them both francs and euros. Most of them will accept your credit card as well. There are phone cards too: Ask for a taxcard (5, 10 and 20Sfr available) at newsstands or railway stations. Switzerland's calling code is +41, Zurich's code is (0)44 or (0)43. We list the country code before all telephone numbers in parentheses. Of course you only have to use it if you are dialling from abroad. If you are already in Switzerland, just ignore the +41 prefix, dial 0 an then the nine-digit number. The Swiss national bank has abandoned its policy of tying the Swiss Franc to the Euro. Currently the exchange rate is quite stable at around 1.09Sfr to the Euro. The currency and legal tender of Switzerland is the Swiss franc (Sfr), which is divided in 100 rappen. There are banknotes of 10, 20, 50, 100, 200 and 1000 francs. The coins in use are 1, 2 and 5 francs as well as 5, 10, 20 and 50 rappen. Lots of shops and restaurants will be happy to take euros as well, but the exchange rate you usually get is bad. You will be better off changing your euros or any other currency at a bank or at the main railway station. Banks usually charge a fee if you are not one of their customers. In Zurich the nearest ATM is never more than a couple of hundred metres away and these days you can even find one of these machines in the smallest Swiss villages. Credit cards are widely accepted - both in shops and restaurants. If you are only drinking, it's usually appreciated if you pay in cash. In the last decade opening hours in Zurich have been liberalised. Shops are now allowed to be open Mon to Sat from 06:00 - 23:00, though only few are open that long. On Sundays only shops in railway and petrol stations are allowed to be open. Here is a rough guide to opening hours in Zurich: Shops in the city centre i.e. around Bahnhofstrasse are usually open Mon to Fri 09:00 - 20:00. Smaller shops including jewellers and shops outside the centre might already close at 18:30 or 19:00. On Saturdays you can expect shops in the centre to be open from 09:00 - 17:00, though some will be open until 18:00 and the big department stores like Jelmoli or Globus even until 20:00. Shopping centres like Sihlcity or Letzipark are open Mon-Sat 09:00 -20:00 (see shopping section). Your best option on a Sunday in the city centre is Rail City, the shops in the underground of the main railway station (09:00 - 21:00) and Stadelhofen Passage at Stadelhofen station next to Bellevue Square (10:00 - 18:00). Some small grocery stores are open until 23:00, e.g. Coop Pronto stores. The big Coop supermarket on the Bahnhofbrücke bridge next to the main railway station is open daily 07:00 - 22:00, except on Sundays. On Langstrasse there are two family-run 24-hour shops. Banking hours are Mon-Fri 8:30 – 16:30. The Swiss like to consider their country the home of direct democracy and citizens here are regularly asked to take a stand on national issues. The two chambers of parliament are (mainly) elected in a proportional voting system and the seven-member government appointed by parliament always includes representatives of all of the four or five major parties. Switzerland is a federal republic consisting of 26 cantons, once sovereign states which retain some independence and have their own constitutions, parliaments and governments. Bern is the capital and the seat of the parliament and the federal authorities. Due to the understanding of political independence many locals favour, Switzerland is not a member of the EU and joined the UN only as late as 2002. Switzerland does, however, cooperate with the EU in many areas, such as on the Schengen visa and border agreement. The Swiss are traditionally either Roman Catholic (42%) or Protestant (35%). The largest (and quite new) minority religious community are Muslims (4%). Zurich is traditionally Protestant, due to the ardent reformator Zwingli who put an end to partying here in the 16th century. But his grip has loosened somewhat in recent decades. Zurich is a safe city, and in fact there is no no-go area, even for single travellers at night. As a visitor you are unlikely to face any problems if you simply use common sense. Of course some petty crime does exist. Be on guard against pickpockets just as in any European city: in a bar keep your wallet in your trousers not in a jacket casually left lying around, and always watch your bags. The legal age for smoking is 16. Smoking in public buildings and transport as well as in restaurants and bars became illegal on 1 May, 2010. However, in the canton of Zurich, restaurants and bars are allowed to have a separate and served smoking room (fumoir). But only a few venues have installed one - we have marked them with the smoking sign in our restaurant and nightlife sections. So if you are a smoker, do as the others do and step outside for a puff - the perfect occasion to get in touch with complete strangers. Note that the law is different in every canton. Tipping is not a must in Switzerland as service is always included in the price. However if you were pleased with the service you got, tips are appreciated and many leave 5-10 percent of the bill. In bars with self service it‘s very common to round up the bill to the next franc. Zurich’s Tourism’s Tourist Information is conveniently located in the main hall of the main train station. This is a onestop solution for all the information you might be missing - and much more. For personal advice at the counter, take a ticket and wait your turn. There are some pads for you to browse and check out the many off ers like tours and venues and you can pick up leaflets and a city map. But they don’t just have advice, they also off er the following services. 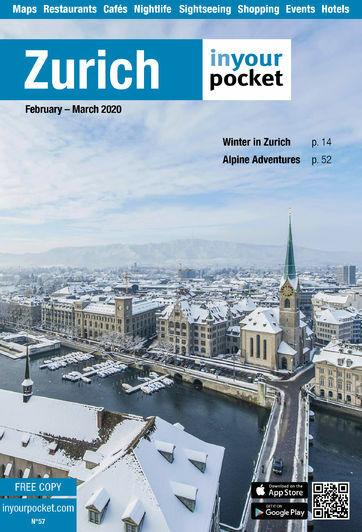 Last but not least you can always pick up the latest copy of Zurich In Your Pocket here - for free, of course. -> In summer 2018 there is a pop-up Tourist Information stand at the store Schweizer Heimatwerk at Uraniastrasse 1. It's open May to September Thu - Sat 11:00 - 18:00 (in July & August also on Mondays). Located in the main hall of the main train station. Open May - Oct 08:00 - 20:30, Sun 08:30 - 18:30. Nov - April 08:30 - 19:00, Sun 09:00 - 18:00. For a stay of up to three months, many foreigners simply need a passport or an ID card to enter Switzerland. Even though not a member of the European Union, Switzerland is a member of the Schengen Agreement. As a result a Schengen visa is valid for Switzerland as well. If you have a visa for Switzerland you can travel freely between the Schengen-agreement countries for a limited amount of time, usually 90 days. Always check these details with a Swiss embassy or consulate. Further information can be found at www.bfm.admin.ch under the title 'Free movement‘. While not all of Switzerland‘s water comes directly from a mountain spring (in fact 70% of Zurich‘s tap water is taken out of the lake), the water quality is generally excellent. Normal tap water is always drinking water, as is water from public fountains of any kind, except in the rare cases when a sign (reading Kein Trinkwasser/ Eau non potable/ Non potabile) states otherwise. Tip: carry an empty plastic bottle with you and fill it up at one of the many fountains or the brass drinking-fountains throughout the city. The exception to the rule is tap water in trains: don‘t drink it. If you‘re thirsty on a train journey, you‘ll just have to hope the minibar service arrives soon.